As several of my players want to continue the game as mentioned in several earlier posts (hey, I'm happy they liked it enough to want to play again. Or else they just don't want to DM a game...I'll stick with the optimistic view) I've been working on the game. I like real things - maps, minis, coins. They help to give a sense of where things are, how they relate, and sometimes can help with immersion. 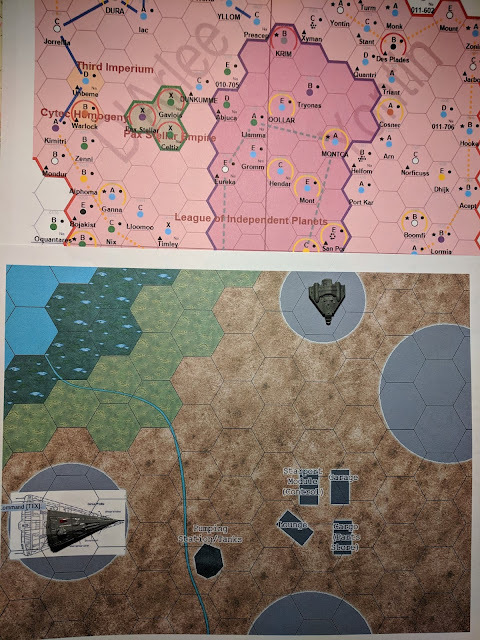 So I printed up a corrected map of the D'Arlee Quadrant, as well as the port at Q'antar (remember this was the 80s and apostrophes were everywhere in SF). Interestingly, the map prints out about to scale with the Scout ship. I suppose I should not have added that image of a Scout ship now. I will have to make a list of things I need to bring to sessions - maps, cardboard heroes (got most of the Steve Jackson things on CD, and I have cardstock, so I've been printing things up), dice, any ship minis that may get used. And - Merry Christmas everyone. I hope everyone has a joyous time.